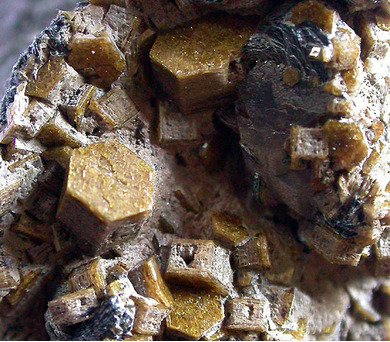 Pyrosmalite-(Fe): Mineral information, data and localities. Named in 1808 by Johann Friedrich Ludwig Hausmann from the Greek πυρ = fire and οσμη = smell, because of the strong odor the mineral gives off when strongly heated. Renamed by IMA with a suffix -Fe, indicating its relationship to pyrosmalite-(Mn). "The mineral was originally named pyrodmalith (Hausmann 1808), then shortly after changed to pyrosmalite by Karsten (1808). History, crystallography and chemistry was discussed by Zambonini (1901, Zeitschrift für Krystallographie vol. 34, p.554-561), who remarked that all historical investigations was performed on material from Bjelke mine up until when material from Dannemora, Sweden was described by Lindström 1888. Essentially all investigations up until Zambonini displayed slight to moderate Fe > Mn, Zambonini’s own investigation on material from Nordmark confirmed this. In the description of the new mineral manganpyrosmalite (Frondel & Bauer, 1953), it was acknowleged that six old (Fe-dominant) analyses together with the new (Mn-dominant) indicated a continuous solid solution series with Fe/(Fe+Mn) ratio from about 0.60-0.25. The old name pyrosmalite was retained for members with Fe>Mn and manganpyrosmalite was applied to members of the series with Mn>Fe. In The iron end-member of the pyrosmalite series,from Pegmont lead-zinc deposit, Queensland, Vaughan (1986, Min. Mag. vol.50:527-531) reported an extremely iron-rich member of the series that had Fe/(Fe+Mn) ratio 0.92. Vaughan explained the nomenclature used by Frondel & Baur, and noted that the Pegmont material fell within the pyrosmalite field sensu stricto. However, Vaughan self in the article used “pyrosmalite” to designate the series and expressed an opinion that the nomenclature was unresolved. In a later short communication, Vaughan (1987, Min. Mag. 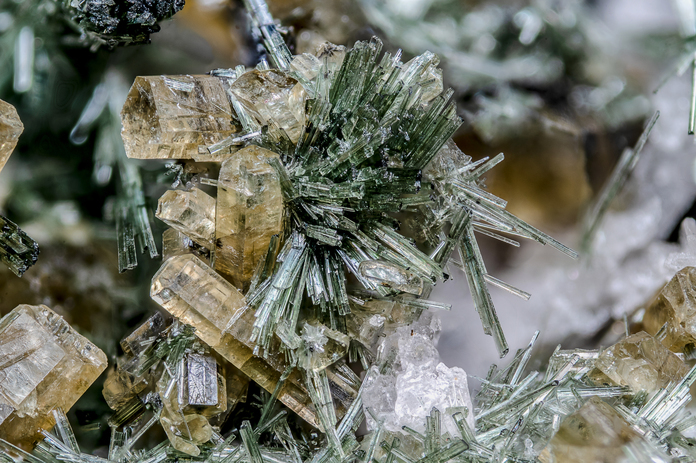 vol.51:174) could report that the IMA Commission had resolved the nomenclature issue “and the Fe-rich species described in Vaughan (1986) is designated ferropyrosmalite”. This may briefly sound as Vaughan discovered a new species, when in fact he was decribing the most Fe-rich of the (Fe-rich) pyrosmalites. Thus, Vaughan was “only” enforcing a nomenclature revision, so that pyrosmalite came to designate the Fe-Mn solid solution series and the Fe vs Mn fields, came to bear names, ferropyrosmalite and manganpyrosmalite, that directly indicated the composition. I think this is a good example of how name revisions get confounded with “new” discoveries and mineralogical history unfortunately gets erased." "In doing so (i.e. 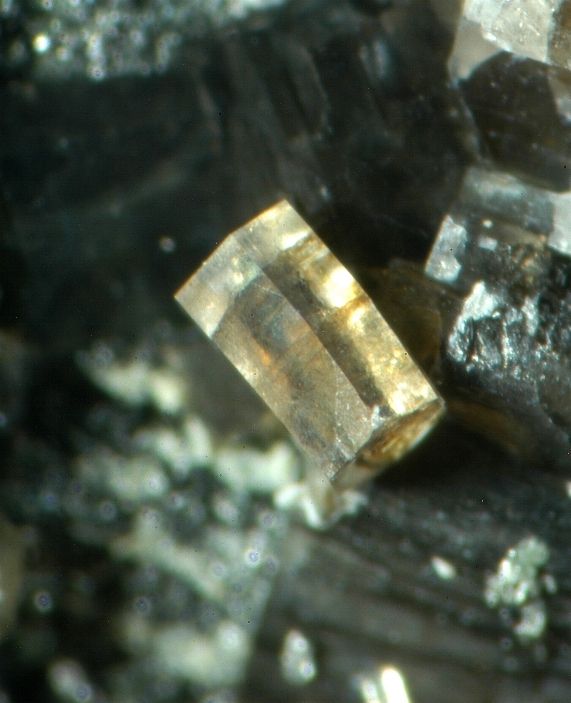 proposing the name manganpyrosmalite) they relegate the name pyrosmalite from that for a species as found with approximately equal amounts of Fe and Mn to that of a variety with Fe>Mn; this departure from the earlier usage is undesirable. The name pyrosmalite is here retained for all members of the isomorphous series." The work of Yang et al. (2012) suggests the presence of disordered structural water in pyrosmalite-(Fe), consistent with infrared spectroscopic data measured from the same sample. Rhodonite 4 photos of Pyrosmalite-(Fe) associated with Rhodonite on mindat.org. Chrysotile 2 photos of Pyrosmalite-(Fe) associated with Chrysotile on mindat.org. Johannsenite 1 photo of Pyrosmalite-(Fe) associated with Johannsenite on mindat.org. Actinolite 1 photo of Pyrosmalite-(Fe) associated with Actinolite on mindat.org. Mineralogical Magazine (1987): 51: 174. Canadian Mineralogist (1993): 31: 695. Mineralogical Magazine (1986): 50: 527. Yang, H., Downs, R.T., Yang, Y.W., and W. H. Allen, W.H. (2012): Pyrosmalite-(Fe), Fe8Si6O15(OH,Cl)10. Acta Crystallographica, E68, i7-i8. 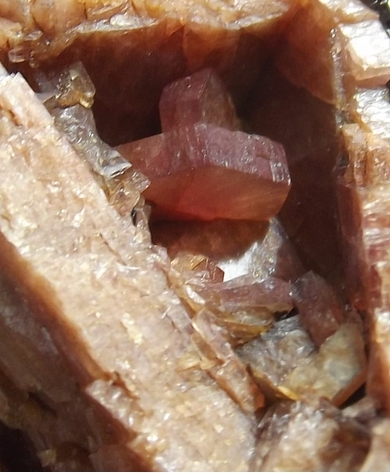 The following Pyrosmalite-(Fe) specimens are currently listed for sale on minfind.com. Birch et al - 1999 - Minerals of Broken Hill, Second Edition. Vaughan, J. P. (1986). The iron end-member of the pyrosmalite series from the Pegmont lead-zinc deposit, Queensland. Mineralogical Magazine, 50(357), 527-531. Y. Chen, M. E. Fleet and Y. Pan (1993) Platinum-group minerals and gold in Arsenic-rich ore at the Thompson mine, Thompson Nickel Belt, Manitoba, Canada. Mineralogy and Petrology 49:127-146; Canadian Mineralogist 31, 695; Chen, Yuan, "Precious-metal Mineralization And Sulfide-silicate Relationships In Some Canadian Nickel-copper Sulfide Deposits: Thompson Mine, Manitoba; Sudbury, Ontario; Dundonald Beach, Ontario" (1993). Digitized Theses. Paper 2231.; Pan, Y., Fleet, M. E., Barnett, R. L., & Chen, Y. (1993). Pyrosmalite in Canadian Precambrian sulfide deposits; mineral chemistry, petrogenesis and significance. The Canadian Mineralogist, 31(3), 695-710. Dare, S. A., Barnes, S. J., Prichard, H. M., & Fisher, P. C. (2014). Mineralogy and Geochemistry of Cu-Rich Ores from the McCreedy East Ni-Cu-PGE Deposit (Sudbury, Canada): Implications for the Behavior of Platinum Group and Chalcophile Elements at the End of Crystallization of a Sulfide Liquid. Economic Geology, 109(2), 343-366. Canadian Mineralogist 31, 695; Canadian Journal of Earth Sciences, 1992, 29(7): 1375-1388; Pan, Y., Fleet, M. E., Barnett, R. L., & Chen, Y. (1993). Pyrosmalite in Canadian Precambrian sulfide deposits; mineral chemistry, petrogenesis and significance. The Canadian Mineralogist, 31(3), 695-710. Canadian Mineralogist 31, 695; Pan, Y., Fleet, M. E., Barnett, R. L., & Chen, Y. (1993). Pyrosmalite in Canadian Precambrian sulfide deposits; mineral chemistry, petrogenesis and significance. The Canadian Mineralogist, 31(3), 695-710. Sundius, N., Parwel, A., Rajandi, B. (1966): The minerals of the silver mines of Hällefors. Sveriges geologiska undersökning, serie C VO: 614 SI: 1-20 SP: eng. Marian Lupulescu (2008) Rocks and Minerals, 83, #3.